While the construction of cycle lanes is often considered to be the main infrastructure measure to promote cycling, the Dutch experience shows that providing accessible and numerous bicycle parking facilities at public transport hubs, such as railway stations, is crucial in fostering multimodality. Combining different transport modes can make journeys faster, more convenient, more reliable and more predictable. For this reason, over the past few years, multimodality has become a key policy objective for decision-makers at the local, national and European levels. The European Commission declared 2018 the ‘year of multimodality’ to show a strong commitment to support projects and initiatives aimed at making it easier for people to combine different transport modes. Research shows that plentiful and secure bicycle parking facilities at public transport hubs can increase the overall efficiency of the transport network. As it enables longer distances to be travelled in less time, cycling dramatically increases the catchment area of public transport, allowing more people to travel in a sustainable way. The Dutch approach to cycling infrastructure investment is an excellent example of strong national support for multimodal transport, in spite of the implementation of the infrastructure being a local issue. In the Netherlands, more than 40 % of train passengers travel to railway stations by bicycle, whereas only 11 % of bus passengers travel to bus stops by bicycle. Dealing with the increasing demand for parking places in public transport hubs is a challenge for local authorities. Dutch municipalities and provinces that are responsible for constructing bicycle tracks and encouraging the use of bicycles have made headlines for building some of the world’s largest bicycle parking facilities. 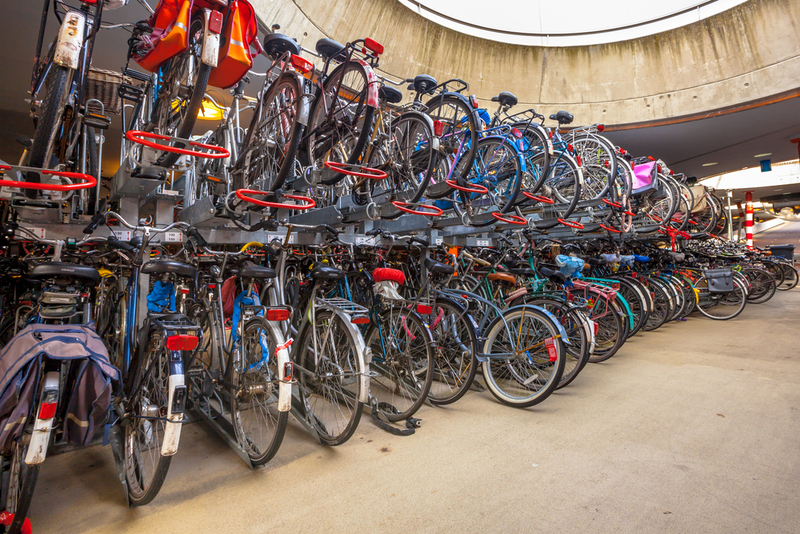 The city of Utrecht has recently opened a three-storey underground bicycle parking facility at its central station (Utrecht Centraal) with room for 12 500 bicycles. However, the demand for space is on the rise. 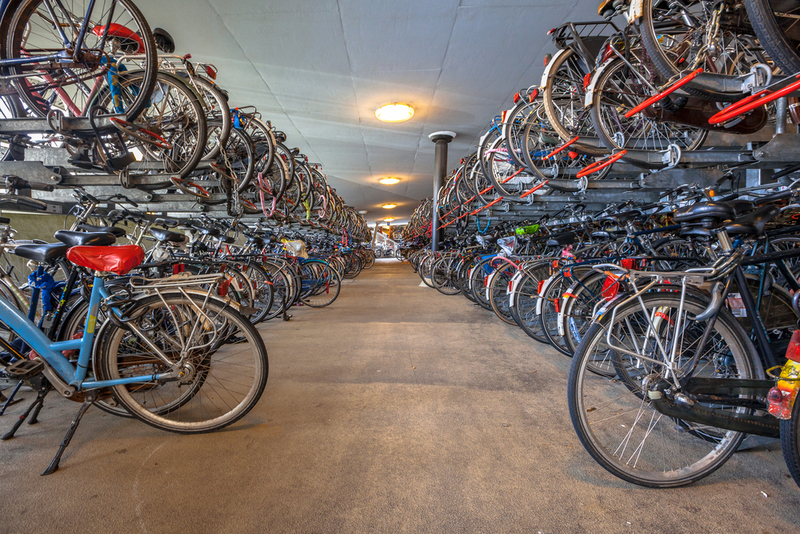 For this reason, Dutch public authorities are working together at the local and national level to increase the capacity of bicycle parking facilities, in coordination with the private actors involved in rail transport. Although the challenge of providing more space to commuters who cycle to a train station is inherently local, the Dutch Government has played a major role in supporting local authorities in this area. In 2012, the Dutch Ministry of Infrastructure and Water Management published the ‘Action Plan for Bicycle Parking at Stations’, which covers the period 2012 to 2020 and has a total budget of EUR 221 million. The Action Plan was agreed in close cooperation with municipalities and provinces. ProRail, the public body in charge of the national railway infrastructure, and NS, the national passenger railway operator, were also key contributors. Prior to the launch of the Action Plan, a study had suggested that between 140 000 and 260 000 additional bicycle parking slots were going to be needed by 2020 to address the rising demand for bicycle parking spaces. In synergy with other infrastructure projects aimed at strengthening the national high-speed railway network, the Action Plan sought to reduce this potential deficit. In 2016, the Ministry for Infrastructure and Water Management, regional stakeholders and representatives of civil society signed the agreement ‘Bicycle parking in stations’, which aimed to address the shortage of bicycle parking space in the short and long term. Apart from committing additional funding for the construction, operation and maintenance of bicycle parking spaces, the parties agreed to make better use of the existing facilities, increase revenue by applying higher costs and rely more on third parties, such as employers, to provide extra parking places. In 2017, the Dutch Government launched the ‘Tour de Force programme’ – a comprehensive bicycle strategy with a strong focus on multimodality. The programme’s key priorities included recommendations for better accessibility to, and design of, public transport hubs. A coalition of 23 stakeholders contributed to formulating the programme’s priorities, including the objective of increasing bicycle use by 20 % between 2017 and 2027. In 2018, shortly after being appointed State Secretary of Infrastructure and Water Management, Stientje van Veldhoven set the objective of having 200 000 residents shift from car to bicycle during her term in office. In a letter sent to Parliament, she highlighted the social benefits associated with an increase in cycling. ‘Investing in cycling contributes to important national objectives such as accessibility, liveability, sustainability and health’, she stated. The letter included a commitment to invest EUR 100 million on further improving the national cycling network (EUR 26 million) and parking facilities at train stations (EUR 74 million). The Action Plan for Bicycle Parking at Stations partially succeeded in reducing the anticipated deficit in bicycle parking spaces, especially at smaller stations. The subsequent actions built extensively on the results of the Action Plan and strengthened the dialogue between all of the stakeholders involved. The ongoing cooperation between Dutch municipalities, the Dutch Government, service providers, research institutes and civil society has ultimately resulted in a significant improvement in the conditions for commuters wishing to travel to public transport hubs by bicycle. Data reveals that cycling in combination with public transport is on the rise. Some 40 % of the 1.2 million daily rail passengers ride their bicycles to train stations. The initiatives presented above have all contributed to helping to meet the increasing demand for more and better parking facilities at stations, thereby encouraging multimodal transport behaviour. Municipalities and provinces have been encouraged to invest significantly in bicycle parking, resulting in a total of 96 000 parking spaces being added since 2012, when the Action Plan for Bicycle Parking at Stations was launched. The overall deficit of parking spaces has been reduced, but not completely, although more people are now able to cycle to public transport hubs and continue their trip by train or bus. Moreover, the improvement of cycling infrastructure has also led to significant environmental, social and economic gains. For every kilometre travelled in the city by bike, a social cost-benefit analysis commissioned by the Tour de Force programme found that the positive effects associated with cycling (reduced congestion, improved air quality, health and safety) are nearly as high as the costs incurred, On the other hand, the results associated with other transport modes such as car or bus were found to be significantly negative. The mid-term evaluation of the Action Plan for Bicycle Parking at Stations, conducted in 2015, highlighted the main challenges for coordinating the joint development of bicycle facilities at stations. The most difficult aspect of the cooperation between municipalities, the national railway operator, the infrastructure manager and other actors was the distribution of costs. The report stressed that the financial burden linked with building, managing and maintaining bicycle parking facilities should be shared fairly between the stakeholders involved. To this end, an analysis of the expectations and interests of each partner is an essential prerequisite for fruitful cooperation. The model of multi-stakeholder cooperation is the main strength of the Dutch example. Although the levels of ambition and investment are due to the Netherlands being the country with the highest number of bicycle trips per year, the model of multi-stakeholder cooperation can be a source of inspiration for other European countries seeking to improve the efficiency of cycling infrastructure with a special focus on bicycle parking facilities. The Dutch experience offers a strong case for greater cooperation between municipalities, service providers, civil society and research institutions to make multimodality a reality in European cities. Image source: © Rudmer Zwerver / Shutterstock - no permission to re-use image(s) without a separate license from Shutterstock.